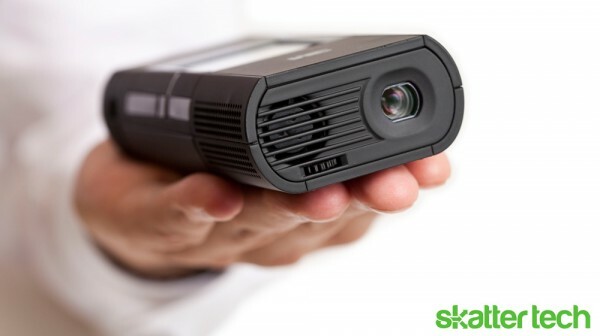 Earlier this year Skatter Tech had a chance to review the MPro120 Pico Projector. Although the picture quality wasn’t the greatest and brightness was fairly dull, it was still an impressively compact solution. Today, 3M announced two new Pocket Projectors that offer 30 lumens of brightness, making them twice as powerful as the older model. Both the MP160 and MP180 offer two hours worth of battery life, a SVGA resolution, and plenty of other features. Unlike most simple handheld projectors, the MP180 offers WiFi and Bluetooth connectivity to enable web browsing and file transfers from laptops and smart phones. It also has a touch screen interface for navigating through office documents, music, photos, and videos. There is 4GB of internal storage and support microSD expansion. A standard USB interface makes it easy to transfer files back and forth. If that wasn’t enough, it turns out that the MP180 also has an integrated MP3 player. If the high-end model is overkill, the MP160 offers a simpler solution. While it doesn’t have a built-in display, wireless connectivity, or internal storage, it still features the same projector technology and stereo speakers. There’s no on-board software for displaying content, but it can project just about anything with the included VGA and Composite Video cables. Both pocket projectors feature an integrated stand, a tripod, and come with common input cables. I’ve been a huge fan of this technology for one simple reason: it makes it possible to put content on a large screen just about anywhere. These are great for college dorms or even business men and women who travel. While the previous models were nearly impossible to see in a brightly lit room, let’s hope that the brighter lamp will solve that issue. For those interested, both models are available for pre-order starting now and will ship in early October. The MP160 sells for $350 while the MP180 goes for $400. We’ll definitely get our hands on these for a full review, so stay tuned. Feel free to follow us on Twitter or like us on Facebook in the meantime. The WiFi and Bluetooth capabilities of the 3M MP180 certainly make this model one to watch! Impressive enhancement of lumens too.